From left to right: Patient Sara Colamonico and Jo Jo Densing, RN, enjoy the magic show as volunteers Jeff Lee and Alan Chien perform card tricks. There’s something magical in the air at the hematology/oncology unit at Ronald Reagan UCLA Medical Center. 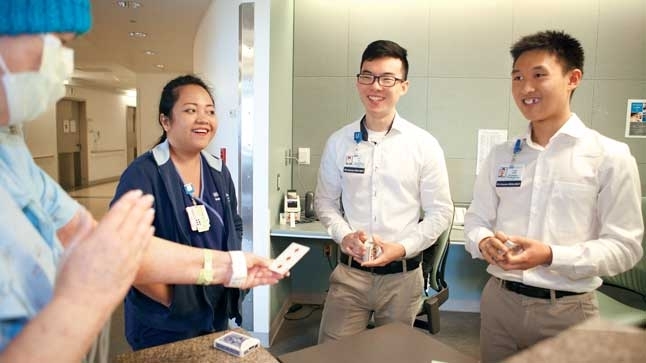 Every week, UCLA Health volunteers and amateur magicians Alan Chien and Jeff Lee entertain patients with their magic tricks. 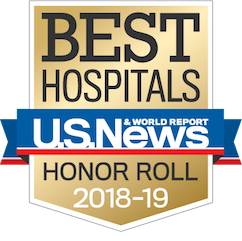 “We set up a stand near one of the nursing stations and perform card tricks and other magic tricks for patients who are walking the hallway to get some exercise,” says Chien. Occasionally, the duo takes its act to patients who are too ill to leave their rooms. In addition to the hematology/oncology unit, the volunteer magicians also perform in the oncology department waiting room at the Peter Morton Medical Building. Nurses also get a kick out of the magic tricks, sometimes serving as magicians’ assistants. For instance, nurses may select or touch a card on a patient’s behalf to prevent the spread of germs and reduce infection risk. Both Chien and Lee are UCLA undergraduate students interested in medical careers. They’re self-taught members of the UCLA Magic and Illusion Student Team, as well as junior magicians at the Magic Castle, a private clubhouse for magicians and magic enthusiasts located in Hollywood. Chien got the idea of bringing magic to the hospital after serving as a volunteer in other roles. “I wanted to do more to lift patients’ spirits, and everyone loves magic,” he says. As a bonus, Chien and Lee both get to hone their magic acts on an audience. “Magic is a good way to help patients and family members pass time and take their minds off of their problems — at least for a short while,” says Lee. Both he and Chien would like to entertain more UCLA Health patients.